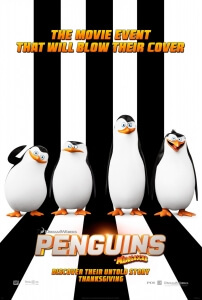 Just reading that above short description of the plot should tell you everything you need to know about The Penguins of Madagascar and how it puts the “mad” into that last word of the title. Perhaps indulging a little too much on the silliness that the previous Madagascar films employed, it is a maniacal animated spin-off that jumps endlessly off the walls like a child having their first sugar rush, and doesn’t let up for almost the entire running time. However, that shouldn’t matter to Madagascar fans of any age because it is endlessly entertaining and fun to watch; for the uninitiated or for those who never expressed interest in DreamWorks Animation’s umpteenth franchise in the first place, it will certainly not convert you. Out of all of the animated film series that Jeffery Katzenberg and co have produced through their company, Madagascar is the one that fully embraces the fact that it’s animated and aimed at children with its Looney Tunes-style slapstick and fast-paced humour. Penguins is no different, taking its focus on the series’ standout characters and injecting them with whatever chemicals made the original films so delightful and funny, but with slightly different results. As stated, it is non-stop in its inane silliness but it loses a bit of the heart in the proceedings – there are signs that it’s there, particularly when focusing on the British-accented “cute” one of the group Private (Christopher Knights, a DreamWorks voice-acting regular), but it’s very rare that it takes full reign of the proceedings. Instead, it sticks to its own target of being as enjoyably silly and kid-friendly as possible, which it does but in a way that sadly makes it a little lesser than the previous films. Like another DreamWorks spin-off – based on the popular Shrek incarnation of Puss in Boots – it works well enough on its own and doesn’t require a viewing of the main films to fully understand it. It sets itself up to take place slightly after the events of Madagascar 3 (bar a March of the Penguins-riffing flashback at the start, with added Werner Herzog narration for maximum strangeness) and goes from there, establishing its own story, its own characters and even its own sense of style. Regarding the story, there’s not much originality to find here since it does all come down to the typical “bumbling heroes must save the world from mad genius” plot that’s been done over and over, but once again it’s all in the execution and it’s entertaining even though we sort of know what path it’s headed down. How about the characters, particularly the new ones? They’re a lot of fun too, including John Malkovich who clearly sounds like he’s having fun as the octopus villain known as Dave. If you find that his strangely articulate voice gets on your nerves, then you probably won’t be happy about him providing voiceover work here; but if that’s the case, at least you can cross off “playing an evil talking octopus” the list of strange roles he’s played over the years. Then, of course, there’s Sherlock and future Doctor Strange himself, Benedict Cumberbatch, as the po-faced wolf known as Agent Classified who asserts himself as a rival between Tom McGrath’s penguin leader Skipper. Cumberbatch’s trademark low-baritone vocal chords bring a touch of class to the character, but when the character needs to be funny he can definitely show that side with aplomb as well. As for the penguins themselves, they perhaps work better as a unit than they do individual characters, with Chris Miller’s Kowalski and Conrad Vernon’s Rico suffering from lack of definable personality compared to the other two more developed members of the group. The action sequences, and there are quite a few of them, are very creative in how mad-cap they can be – one particular set-piece is a chase through the streets and canals of Venice which somehow finds many ways to use a boat on dry land – and the humour is very much in tone with the previous Madagascar entries. But while The Penguins of Madagascar doesn’t quite match up to its predecessors in terms of heart and warm character interaction, it’s a decent piece of children’s entertainment that kids will enjoy and tired parents will be grateful for over the ninety-minutes they’re on-screen. The Penguins of Madagascar should makes fans of the original films happy with the same mad-cap humour one expects from those films, even though some of the heart is missing and its silliness can be overwhelming at times, more so than usual with any Madagascar film.